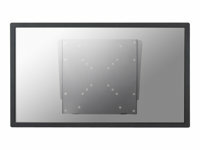 Wall mount for LCD display, silver, screen size: 10"-40"
The NewStar FPMA-W110 is a fixed wall mount to mount a LCD/TFT screen on the wall. With a depth of only 1,7 cm, this mount is the flattest product available. It can be used for flatscreens up to 40" with a maximum VESA hole pattern of 200x200 mm. The carrying weight is 35 kg. The product also has the opportunity to lock the flatscreen. The depth of 1,7 cm can be changed to 4 cm with spacers. These are included. Mount your flatscreen like a painting on the wall with this smart wall mount from NewStar.